You are here: Home / Apple / How to install ESXi 5.5 Patch03 on the new Mac Pro 6,1? I have received several questions from customers asking how to go about installing the latest ESXi 5.5 Update 2 Patch03 on the Apple Mac Pro 6,1. Luckily, I was able to borrow one of the Apple Mac Pro 6,1 we had within VMware Engineering for a couple of days to document the process. Step 1 - A prerequisite that must be met prior to installing ESXi is to have the Apple boot ROM update on the Mac Pro 6,1 running on MP61.0116.B05 or higher. This great piece of tidbit came from Josh who discovered issues while trying to install ESXi and found out this was a requirement after opening a case with Apple Engineering. It turns out that there is not an EFI update and the ONLY way to update the boot ROM was to install Yosemite (OS X 10.10) as it contains an update which can be applied to the Mac Pro. Thanks Josh for sharing this tip with us! You can check the boot ROM by either following this Apple KB here or by running system info with an OS X image on a bootable USB device which is what I did to verify as seen in the screenshot below. Step 2 - Once you have met the prerequisite, you will need to download the offline bundle for ESXi 5.5 Update 2 Patch03 which contains the Mac Pro 6,1 enablement along with other bug fixes. 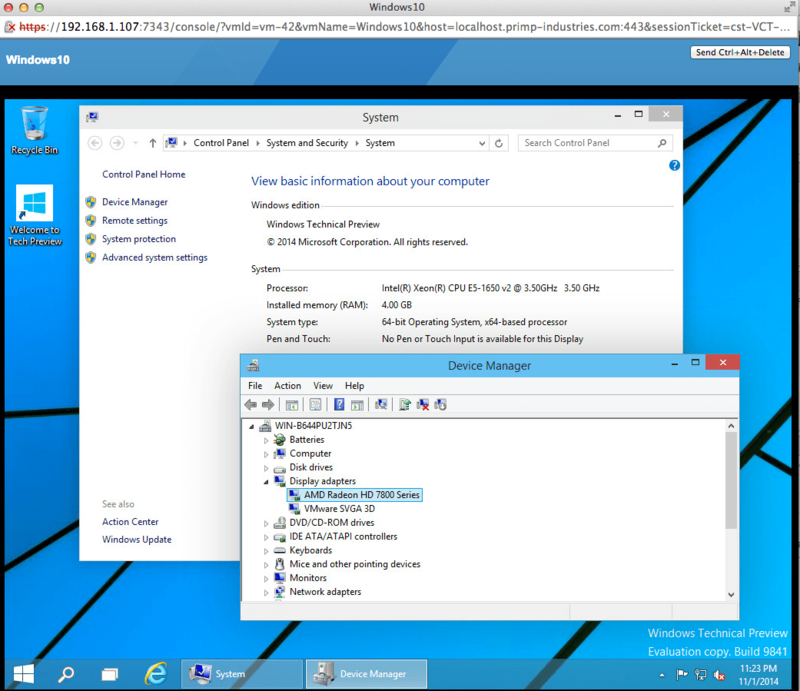 You can do so by going to VMware Patche portal and under ESXi, you should find ESXi550-201410001.zip at the very top. Step 3 - Next you need to convert this offline bundle into an ISO image that you can load onto a USB device, this is the simplest way to install ESXi. To do so, you will need a Windows system as it uses a tool called VMware Image Builder which is only available for Windows. 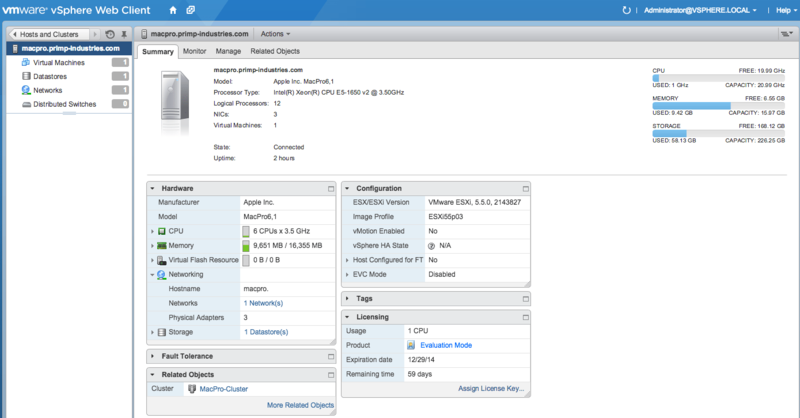 Image Builder is part of the PowerCLI toolkit which can be downloaded here. 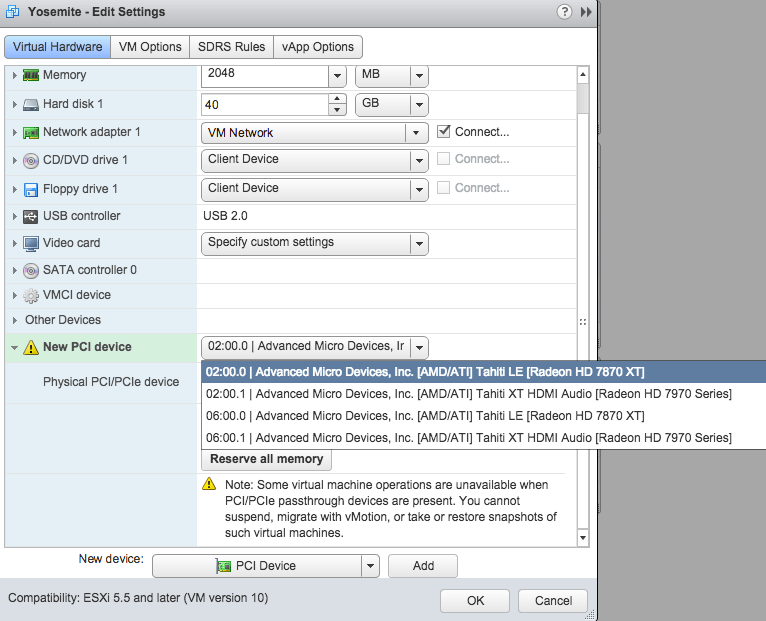 Step 9 - Once the ISO has been created, you can now create a bootable USB containing your ESXi installation. I like to use Unetbootin but there are several other tools you can use, select whichever one you are comfortable with. Step 10 - Plug the USB device into your Mac Pro and make sure to hold down the "ALT" key so you can select the device to boot from and you can start your ESXi installation as you would normally. The Mac Pro 6,1 has two on-board Ethernet ports and comes with 6 x Thunderbolt connections, so you can connect quite a bit of networks if you need to. I know a couple of you have asked whether the two Radeon 7870 GPU's could be passthru into a guest OS such as Mac OS X or Windows and it looks like they can from the ESXi point of view, however this is not officially supported by VMware, so YMMV on whether the guestOS can actually make use of the GPU. For Windows it looks like it was able to properly detect the GPU (as shown in the screenshot) below and for Mac OS X it does not look like it's properly detecting the GPU. I will see if I can investigate this further but there is a good chance that passthru for Mac OS X guest will not work. If you have made it this far and realize you rather not go through that long process (which is quite short actually), then I you will be quite happy to see that I have done the hard work for you and have created an ESXi 5.5 Update 2 Patch03 ISO which you can download here. Hope you enjoy your new Mac Pro and running ESXi on top of it! Thanks again for all of your efforts on the Mac Pro 6,1 front. We truly appreciate it! With that said, I am in dire need to connect a 4TB Thunberbolt drive to ESXi running on the MacPro 6,1. I used rufus to create the iso, very simple to use and free. 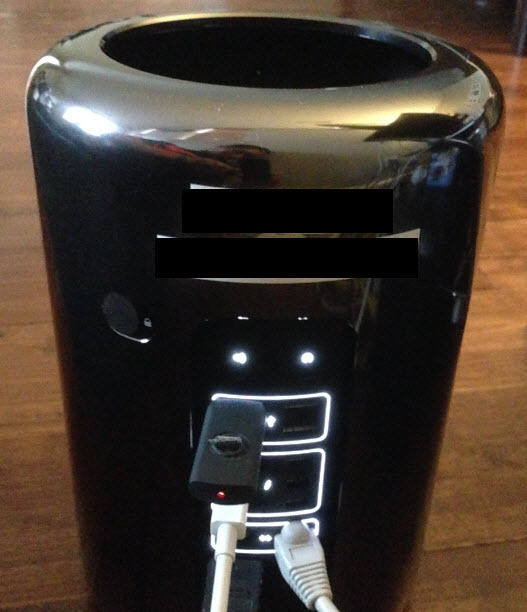 I am in the lucky position to have gotten a free testbed quad core mac pro with 32gb. Then i crossreferenced VMWAREs compatibilty site. Attos Celerity came up for 5.5 certified and being Thunderbolt certified. Iam sure others work if you have drivers, but if you need new hardware anyways I thought this was the best approach. Then i followed your instructions …. sad face …no FC card visible . Only passthrough available. Now being im a newbie I had no idea one could/should install drivers later on…. 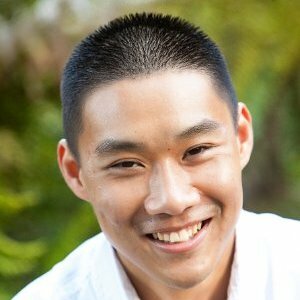 I researched and enabled ssh and scped a vib file download from VMWARE to my datastore. Reboot : PRESTO. 2) I plugged new keyboard and mouse in 2 and 3. usb ports, yosemite VM is not detecting the keyboard or mouse. Very interesting reading. How is non-gaming video performance with Yosemite? Any idea whether getting video passthrough working is more of a VMware or Apple issue? First of all, thanks for your great blog! I downloaded the ISO you created and was able to install ESXi on a Mac Pro 5. So far everything is working great, but I’m wondering how to change the screen resolution. Nice job! One item, I am not seeing the three NICs as shown above for Thunderbolt. I would truly like to connect a storage device using Thunderbolt. Your suggestions? Thanks. I am completely lost on how to get the web client to work. There is a lot of detail missing in step 10. I have it exi 5.5 installed, but have no clue how to open any clients on a mac. Any hints? 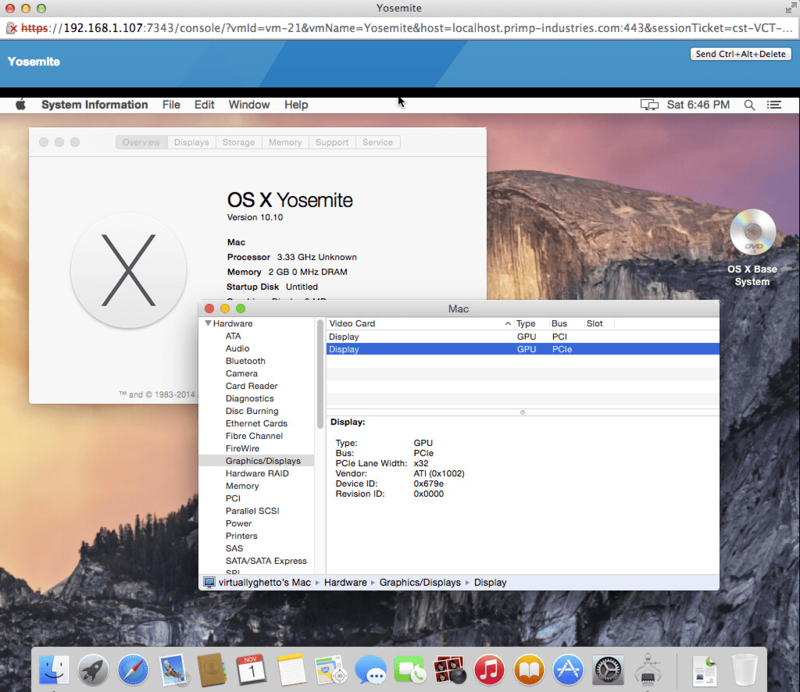 Hi, I read that I must have an OS X 10.8 installation in order to install OS X on VM. how can I get older OS X installation? Need help – I get error “The system has found a problem on your machine and cannot continue. Could not load multi boot mobules:Bad parameter”, while installing the ISO provided at the end of the article. 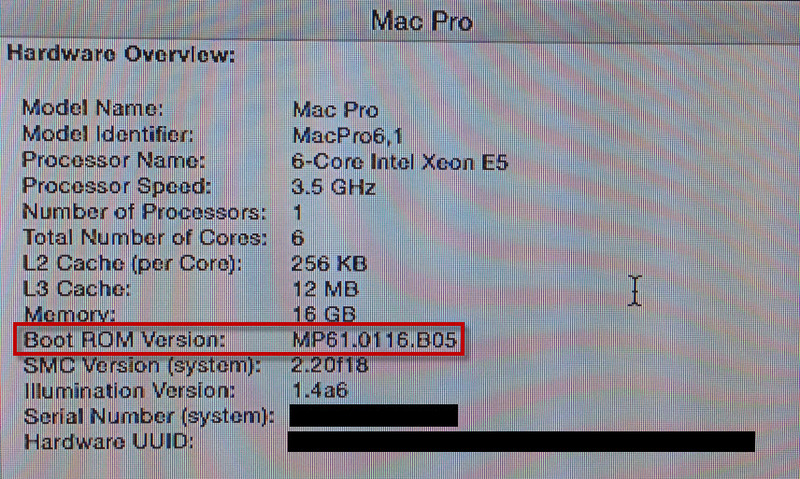 I’m on Mac Pro 6,1(late 2013)/3.5 GHz 6-Core Intel Xeon E5 with Boot ROM MP61.0116.B11. Any one? Successfully running ESXi 6 on a MacPro 5,1 and 6,1. However, on the Health Status I only get “Processors” and “Software Components”. Is there any way to get additional sensors? Temperature is the most important one, to make sure the Macs are running cool. Would you be able to provide an image of a 5.5 installer that recognizes the new internal SSDs? I tried re-install from the USB CDRom again but always not be detected. Any idea ? thanks.